X-Girl is a Japanese Magazine as well as a fashion brand catalogue. It offers the latest fashion insights into the hottest clothing trend. In previous month’s issue of the X-Girl magazine, the promo gifts come in a 3-in-1 package! This promo gift package consists of a pouch, recycled bag and shopping bag! ODM would have to say that it is truly attractive for any customer to purchase this magazine and receive three different promo gifts at slashed prices! The items are limited in edition and cannot be bought in stores. Most importantly, they are highly functional and convenient to carry around. Why did X-Girl make use of this exclusive 3-in-1 package? The pouch is small and suitable for travelling needs. It can be used to contain cosmetic products and small accessories. 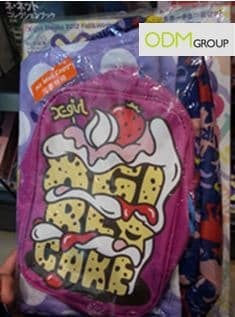 The pouch has a bright purple exterior and a cake design. The recycled bag has a light purple and polka dots exterior. It is is eco-friendly, reusable and multi-purpose. On the other hand, the shopping bag is equally attractive to hold your purchases and easy to carry it around. Though customers may have to pay slightly more to get this package, it is still a purchase worth the money! With this package, customers can get the X-girl magazine together with the pouch, recycled bag and shopping bag for a much better price! The promo gifts are branded with the X-Girl magazine logo to increase brand awareness. This acts as free advertisement for X-Girl, especially when users carry these promo gifts around. As such, there will an increase in sales of the X-Girl magazine. Not only so, it aids in brand recall as well. Existing customers will be reminded of the brand and be spurred to make repeated purchases, which encourages brand loyalty.